Botox injections- These are effective in reducing the downward pulling action of muscles in the face and thus lifting the skin upward. Dermal fillers- They help in replacing lost volume in the face by re-expanding and tightening the skin. RF pixel- This is useful in resurfacing as well as tightening facial skin. Radiofrequency skin tightening- Through a process of gently heating the skin, it causes considerable tightening and lifting, without any pain or recovery period. Advanced technology now enables the skin on the face to be lifted and tightened without surgery. These techniques are minimally invasive and in most cases, require no significant recovery period. The muscles of the face generally work in pairs; there is a downward pulling muscle and an upward pulling muscle. For instance, when you smile, one muscle pulls the corners of the mouth up while another pulls it down. Botox injections can be used to selectively relax facial muscles. If the downward pulling muscle is relaxed, the upward pulling muscle becomes relatively stronger, causing a lift in the face. Neck areas for the jowls and the jaw line (often referred to as the “Nefertiti lift”, alluding to the Egyptian queen known for her defined jaw line). Facial volume loss caused due to aging often results in skin laxity. This can be compared to a ball that loses some of its air over time and thus needs to be re-inflated. This lost volume can be replaced by dermal fillers that tighten and lift the skin. They can be used in the cheeks, brows, jaw line, and chin to improve the firmness of skin. Through a single machine, called accent ultra , it is now possible to get rid of facial lines and wrinkles, contour the face, reduce facial fat and tighten skin. 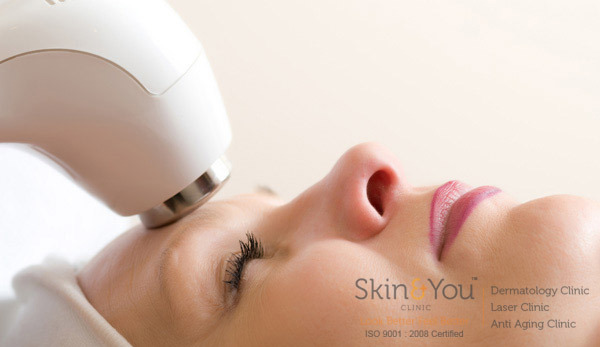 Embedded in it are two distinct and advanced technologies, namely ultrasound and radiofrequency that together enhance the treatment for facial contouring. Its dual waves penetrate through the epidermis and dermis to the subcutaneous fat, providing effective results for patients. This unique approach is a major step forward in providing significant cosmetic results with minimal downtime, especially when used in conjunction with the other unique treatments for skin tightening and recon touring and rejuvenating your skin. This combined technology embraces multiple RF therapy that cannot be achieved with other light based treatments. This advanced treatment is the first cosmetic RF (radiofrequency) device to provide an effective, gradual procedure that creates new skin with no downtime. Why Skin & You Clinic For Non-Surgical Skin Tightening And Lifting?